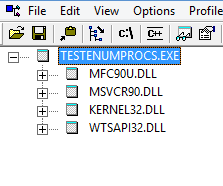 Activation context generation failed for "J:\TestEnumProcs.exe". Dependent Assembly Microsoft.VC90.MFC,processorArchitecture="x86",publicKeyToken="1fc8b3b9a1e18e3b",type="win32",version="9.0.21022.8" could not be found. Please use sxstrace.exe for detailed diagnosis. INFO: Parsing Manifest File J:\TestEnumProcs.exe. INFO: Post policy assembly identity is Microsoft.VC90.CRT,processorArchitecture="x86",publicKeyToken="1fc8b3b9a1e18e3b",type="win32",version="9.0.30729.4926". INFO: Attempt to probe manifest at C:\Windows\WinSxS\manifests\x86_microsoft.vc90.crt_1fc8b3b9a1e18e3b_9.0.30729.4926_none_508ed732bcbc0e5a.manifest. INFO: Manifest found at C:\Windows\WinSxS\manifests\x86_microsoft.vc90.crt_1fc8b3b9a1e18e3b_9.0.30729.4926_none_508ed732bcbc0e5a.manifest. INFO: Attempt to probe manifest at C:\Windows\assembly\GAC_32\Microsoft.VC90.CRT.mui\9.0.30729.4926_en-US_1fc8b3b9a1e18e3b\Microsoft.VC90.CRT.mui.DLL. INFO: Attempt to probe manifest at C:\Windows\assembly\GAC_32\Microsoft.VC90.CRT.mui\9.0.30729.4926_en_1fc8b3b9a1e18e3b\Microsoft.VC90.CRT.mui.DLL. INFO: Attempt to probe manifest at J:\Microsoft.VC90.MFC.DLL. INFO: Attempt to probe manifest at J:\Microsoft.VC90.MFC.MANIFEST. INFO: Attempt to probe manifest at J:\Microsoft.VC90.MFC\Microsoft.VC90.MFC.DLL. INFO: Attempt to probe manifest at J:\Microsoft.VC90.MFC\Microsoft.VC90.MFC.MANIFEST. I know that this issue can be fixed by installing the "MFC Redistributable Package" on that system, but I would really like to avoid that and try to fix this issue by adding the missing DLLs. I wrote an article about this for VS-2005 on Codeproject. You can find the code for VS-2008 on my blog. It is German, but you only need the include file. The rest and the explanation can be found in the CodeProject article. With the include file, you don't have to change the manifests manually. It is all done just by using the include files and set some defines. The trace shows that msvcr90.dll is present in the side-by-side cache but mfc90u.dll is not. Fairly unusual, smells like another installer was run on that machine before that only deployed with it needed. Local deployment is technically possible, it requires surgery on the manifests. You cannot remove them completely, there's a check built into the CRT that verifies that they are present and the app will fail with R6034 if they are not. The surgery changes the manifests to switch from side-by-side to private assemblies. Which requires that the "publicKeyToken" element is removed from the manifest entries. The private copy of the DLLs must also be copied into directories with the correct names and a tweaked manifest. The steps are outlined in this blog post. Just running the vcredist installer is obviously much simpler and less error prone. See if you can convince the linker to spit out a list of library and DLL dependencies at build time. Then you hunt them down from your dev machine and statically include them. Kind of a pain. I expect you should be able to see exactly what the dependencies are if you dig. Windows 10 and PCs with Visual Studio will need this fix. Not the answer you're looking for? Browse other questions tagged c++ winapi visual-c++ dll mfc or ask your own question. Why won't my VS2010 native C++ application suddenly start, giving a side-by-side error? Why do i get MFC runtime error when I am not using MFC?